Other than having Maxine Waters as Chair of the House Banking committee and it being stacked with pitbulls like Alexandria Ocasio-Cortez, bankers are currently having a swell time in the U.S. 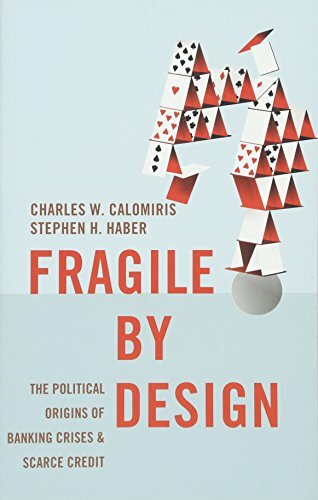 Which is the perfect time to read the Charles Calomiris and Stephen Haber 2014 book “Fragile By Design: The Political Origins of Banking Crises and Scarce Credit.” The authors don’t believe banking crises are caused by shocks which come out of the blue, but, instead, politics. Who knows, maybe Chairwoman Waters may oversee the next banking bust, because we are due. As the authors write in the preface “that the politics that we see operating everywhere else around us also determines whether societies suffer repeated banking crises (as in Argentina and the United States), or never suffer banking crises (as in Canada).” We’ll see how Canada’s banking system weathers the current housing crash. Yes, according to Calomiris and Haber, we get the banking system that political power distributes. The good old U.S of A has had 14 banking crises over the past hundred years. See above; the next one is likely right around the corner. This book isn’t about 100 percent reserve banking or any other items on the Austro-libertarian banking wish list. But for the free-bankers out there who claim fractional reserves would be oakie-doakie in anarchy, the authors make the point often that banks, as they are, require government power to keep them standing. And sometimes, that isn’t enough. As you can imagine there are conflicts between banks and their government hosts. Government looks to banks for funding at the same time government regulates them. The credit contracts which banks use, must be enforced by government, according to the authors. However, banks need the political support of their debtors. Also, government decides who loses when banks fail while depending on depositors for political support. This tangled web of political deals “are guided by the logic of politics, not the logic of the market.” So who are the benefactors of this Game of Bank Bargains? Government, first and foremost, and groups which partner with government, second. Yes, “banking is all about politics--and always has been.” The state needs banks to aid rulers, merchants, and financiers. As governments grow, so grow the banks. In U.S., banks grew via merger in the 1990s and a policy no one was paying attention to in the 1970s and 1980s--the Community Reinvestment Act--became leverage in the Game of Bank Bargains. Banks which wanted to expand needed regulator acceptance and community groups quickly learned if they wanted to pressure banks into lending in low-income neighborhoods, they needed to insert themselves into these merger negotiations. Meanwhile Fannie Mae and Freddie Mac were looking to earn their CRA stripes by weakening their underwriting standards. Instead of a homebuyer needing to put 20 percent down towards the sales price, Fannie and Freddie lowered the requirement to 3 per cent. Also, the GSEs (government sponsored entities} began buying mortgages with weak borrower credit scores. In 1993, HUD required the GSEs to devote 30 percent of their loans to low and moderate income borrowers. Then came low-doc, Alt-A and subprime mortgages--$4.8 trillion dollars worth. By 2008, half the mortgages in America were high-risk. So what did the GSEs get for doing these do-gooder loans? The GSE Act of 1992 allowed Fannie and Freddie to hold only $2.50 in capital against $100 of these loans. At the same time, banks had to hold $4.00 against $100 in mortgage loans. Bankers saw the light and began buying mortgage-backed securities (MBS) because regulators only required the banks to hold $1.60 in capital for every $100 invested, after all, the compliant rating agencies called them AAA. So, banks would originate a mortgage sell it to Fannie or Freddie and buy it back as part of MBS. More leverage, more profits. Next came collateralized debt obligations (CDOs) which are derivatives of MBS. CDOs could package a “diversified” bundle of riskier MBS. These packaged financial products all depended upon borrowers making their payments. The belief was that borrowers with poor credit histories and 3 percent down payments would make their payments as diligently as borrowers with good credit habits and 20 percent down payments. The authors debunk the notion that the 2008 banking crises was caused by deregulation. There was plenty of regulation “just piles and piles of ineffectual regulation.” This was a leverage-fueled frenzy by borrowers and lenders alike. Regulation was in place for a world of conventional mortgages made to conventional borrowers. But the world had become a low-doc, negative amortizing, adjustable rate world. The authors explain that 80 percent of mortgages were securitized and thus only $2.05 in capital was needed to support $100 in loans. What could go wrong? Meanwhile, the Federal Reserve was lowering rates providing the incentives to borrow and buy, for both home buyers and banks. The less paid as a downpayment, the better. Ratings agencies only went back ten years to determine stress-test models and the results told them, housing prices never fall: Let’s call everything AAA. The authors tell the reader that the lesson of the great recession is not to expect politicians or regulators to do anything to prevent the next banking crisis. Act prudently yourself, but recognize that you’ll help pay the tab.